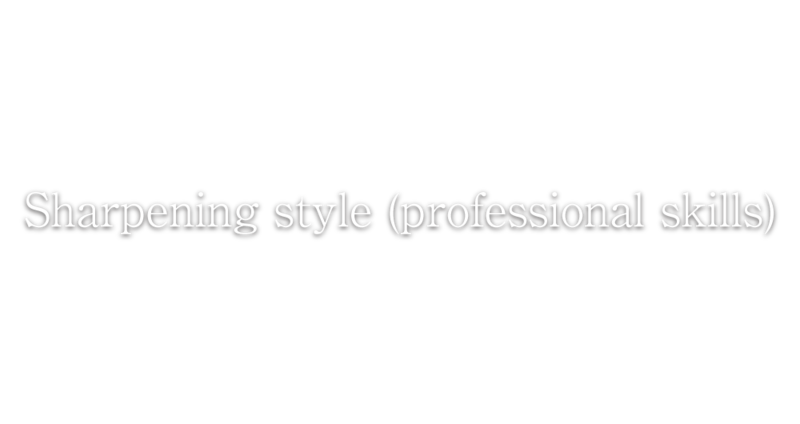 Honing style (professional skills)｜Miyagoshi Seito Ltd. The various kinds of knives and various raw materials, the wide usage and the different people who use the knives allow the various kinds of sharpening styles. There are several fundamental points that one needs to bear in mind; however, there is no definite answer because everyone has their own ways of sharpening when it comes to finishing the tools in a good way. The quality standard of the sharpening stones depends on the following conditions: whether the user is a beginner or not, the one’s physical size represented as body strength etc., and things they honed. Using the sharpening stone that meets one’s demand lead to the smooth sharpening regardless of its quality. Why don’t you tailor one’s tool to one’s own way and make comfortable use, having the vitrified made sharpening stones that have high performances. The professional sharpening is introduced here. There are many sharpening tips. In order to make the ideal finishing, the efficient working environment is achieved while thinking about how to hone it. Politely sharpening with short strokes is a good approach for the sharpening beginner. You can clearly feel the part where you hone, which enables the sharpening with reasonable strength.